If you have come here from Cat's blog you are on the right path. 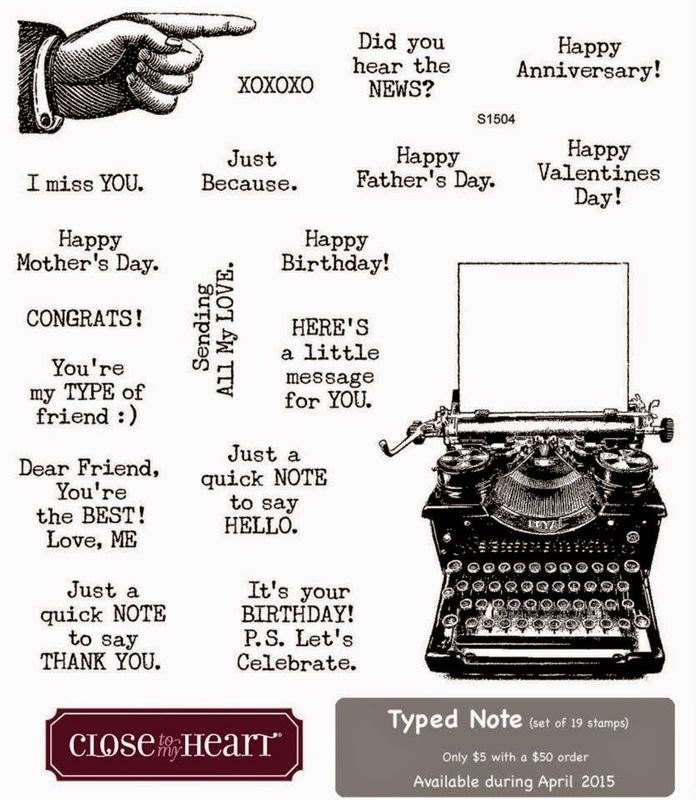 This month we are featuring a fun stamp set with a retro typewriter and loads of greetings. There are 19 stamps in all. 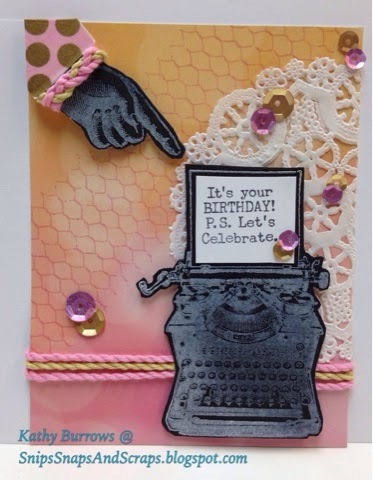 Are you ready to see lots of creative ways to use this stamp set? This month I stepped out of my creative comfort zone. I tried to create a different type of card that I often admire, but usually don't feel too successful with -- a collage card. The jury is still out, but it was fun to try. I'd love to hear suggestions from anyone who has advice for implementing this technique. 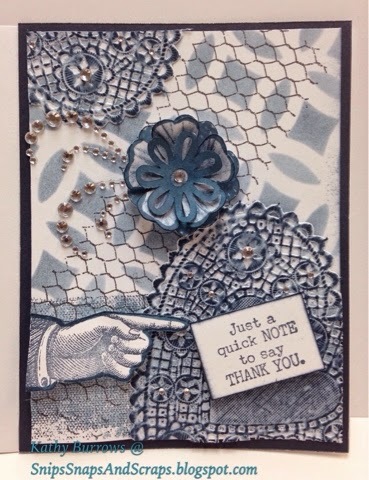 For this card I used Colonial White Ink and Clear Detail embossing powder on Black card stock and then hand cut the images. The background paper is from the Brushed paper pack. 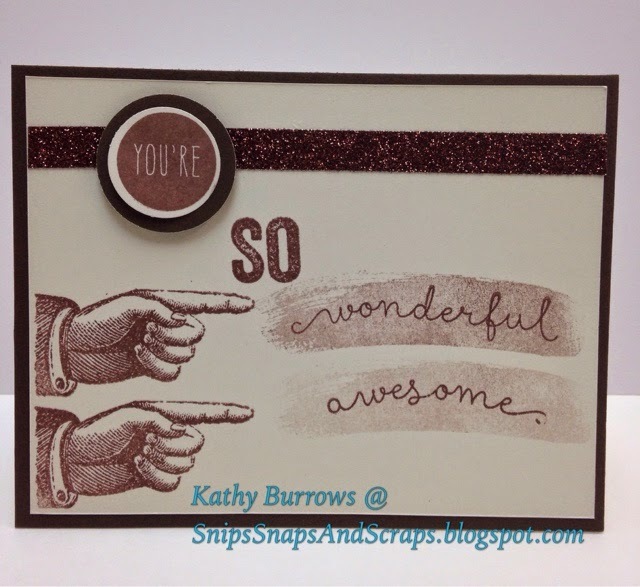 The background stamp is from the Distressed Backgrounds Flair (D1544) and was stamped in Pixie ink. 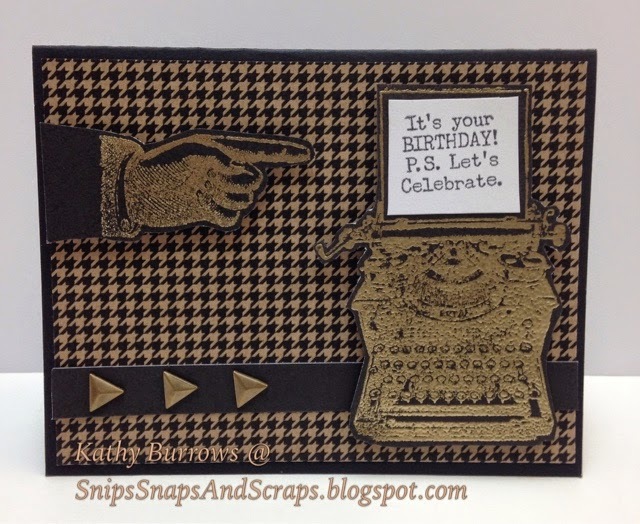 The sleeve was created using a scrap oF Pixie card stock and covered with Gold Polka Dot washi tape (Z1920). Other supplies used on the card were Gold and Silver sequins (colored with a ShinHan Twin Touch Marker - Peony Purple Z2462), Extra Thick Twine (Pixie Z3035) and (Flaxen Z3036), and a paper doily. Now something simpler --- Lately I have also been trying to design masculine cards. Thought this might be good with a thank you message inside. 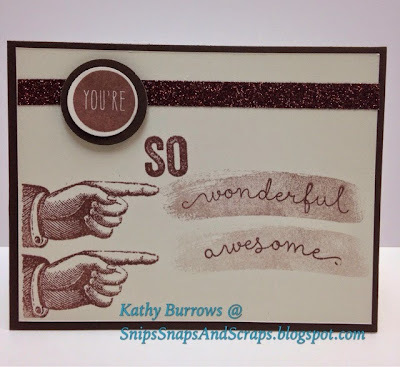 In addition to the stamp of the month, I also used the You're the Bomb (C1617) stamp set and one of my new favorites, Brushstrokes Flair (C1608). Using chocolate ink, the brushstrokes are stamped second and third generation to get the lighter effects. Another great resource for designing masculine cards has been paper from the Paper Fundamentals (Basic Assortment Z1939). Both the typewriter and the hand were embossed using our Princess Gold Embossing Powder (Z2066) from Ranger on black card stock and then hand cut. 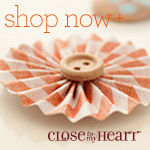 You can find this stamp set as well as any of the other supplies listed on my website where you can shop 24/7. 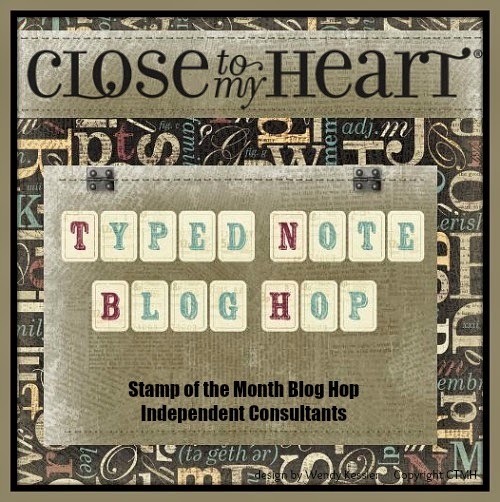 Be sure to visit all the consultant's blogs to see all the great ideas they have come up with. Before you "hop" on, I'd love a comment to know you've visited. Now it's time to hop on to see what our next creative consultant has come up with. So on to Stefani's blog.